In 1841, Carl Gustav Mosander obtained a novel oxide from his experiments with rare-earth containing minerals. He believed this compound to be an oxide of a new rare earth element that he called didymium, and this element was included on an early version of Dmitri Mendeleev’s periodic table. 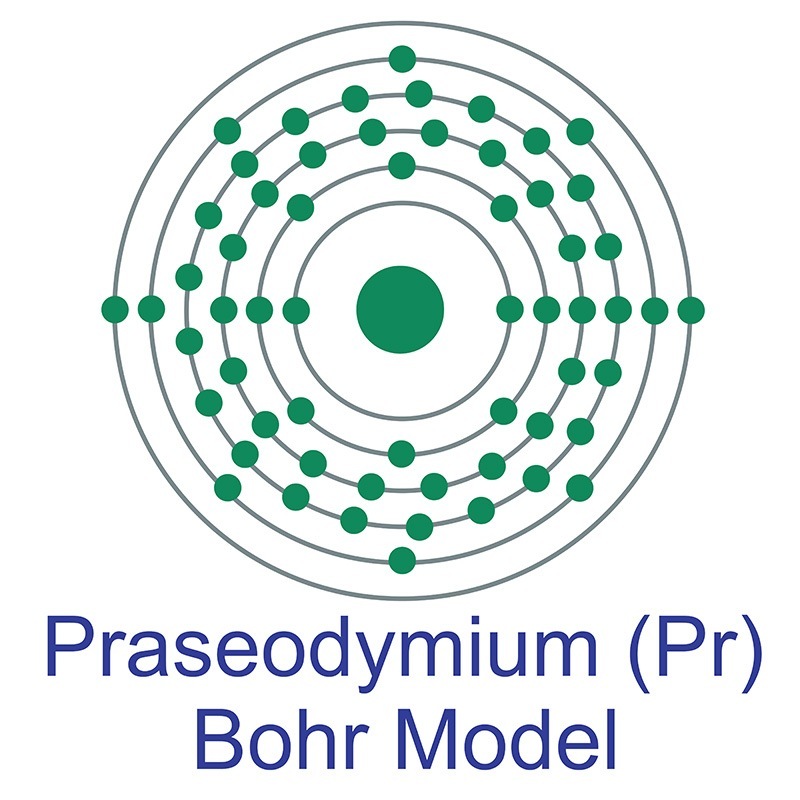 Later experiments by Austrian chemist Carl Auer Welsbach in 1885 showed that this oxide was actually a mixture of salts of two new elements, which were subsequently named praseodymium and neodymium. Praseodymium salts are yellow-green in solution, leading to the naming of the compound from the greek word prasinos, meaning green, and the previously chosen root didymos, meaning twin. Like many of the rare earth elements, praseodymium is used primarily in small amounts to “dope” other materials, as its presence even in small concentrations imparts useful properties. In many cases, praseodymium is used to alter optical properties or in light production or detection applications. Praseodymium is one of the rare earth elements found in didymium glass, which is used in safety goggles that block potentially harmful intense ultraviolet, infrared, and yellow light produced by during some types of welding and glassworking. Fluoride glass doped with praseodymium can be used as a fiber optical amplifier for use with light around a wavelength of 1300nm. Praseodymium-doped crystals are used as gain media in solid-state lasers. Praseodymium is one of several rare earths used to produce extremely bright carbon arc lights, though these are becoming much more rarely used in their primary application in the motion picture industry. Praseodymium compounds can be used yield either a yellow or yellow-green coloring, depending on the application; in glass and enamel, praseodymium is used for yellow coloring. Adding praseodymium to cubic zirconia produces a yellow-green stone which mimics the mineral peridot. Modern medical computed tomography (CT) scanners often use praseodymium-doped scintillator crystals in their X-ray detecting sensors. Additionally, praseodymium is used as a dopant in alloying applications, catalysts, and other novel materials. Small amounts of praseodymium alloyed with magnesium produce high-strength metals used in demanding applications such as jet engines. Praseodymium-nickel alloys exhibit an extremely strong magnetocaloric effect and have been used in refrigeration devices to attain extremely low temperatures. Praseodymium is used in small amounts in neodymium magnets, which are the strongest permanent magnets commercially available. Praseodymium-doped ceria can be used to catalyze a variety of reactions. Praseodymium-doped thin films are being investigated due to a variety of potentially useful properties including photoluminescence. Praseodymium-doped yttrium silicate crystals are used in quantum computing research. Praseodymium nickelates, praseodymium doped ceria, and praseodymium barium copper oxide are all being researched as cathode materials for solid oxide fuel cells. Historically, the rare-earth alloy mischmetal was used in lighter flints, and modern flints still contain small amounts of praseodymium along with other rare earths. Finally, praseodymium oxide thin-film surface coatings provide antireflective properties and durability. Praseodymium is one of the light rare earths and is typically sourced, along with other elements from that group, from the minerals monazite and bastnasite. Praseodymium is highly valued in glass and ceramic production as a bright yellow pigment. Much research is being done on its optical properties for use in amplification of telecommunication systems, including as a doping agent in fluoride fibers. Praseodymium is available as metal and compounds with purities from 99% to 99.999% (ACS grade to ultra-high purity). Metallic forms include pellets, rod, wire, and granules for evaporation source material purposes. Praseodymium oxides are available in powder and dense pellet form for such uses as optical coating and thin film applications. Oxides tend to be insoluble. Fluorides are another insoluble form for uses in which oxygen is undesirable such as metallurgy, chemical and physical vapor deposition and in some optical coatings. Praseodymium is also available in soluble forms including praseodymium chloride, praseodymium nitrate, and praseodymium acetate. These compounds can be manufactured as solutions at specified stoichiometries. Praseodymium is a Block F, Group 3, Period 6 element. The number of electrons in each of praseodymium's shells is 2, 8, 18, 21, 8, 2 and its electronic configuration is [Xe]4f3 6s2. The praseodymium atom has a radius of 182.pm and its Van der Waals radius is 239.pm. In its elemental form, CAS 7440-10-0, praseodymium has a grayish white appearance. It resembles the typical trivalent rare earths, however, it will exhibit a +4 state when stabilized in a zirconia host. Unlike other rare earth metals, which show antiferromagnetic and / or ferromagnetic ordering at low temperatures, praseodymium is paramagnetic at any temperature above 1 K. Praseodymium is found in the minerals monazite and bastnasite. Praseodymium was discovered by Carl Auer von Welsbach in 1885. The origin of the element name comes from the Greek words 'prasios didymos' meaning green twin. Praseodymium is somewhat toxic. Safety data for Praseodymium and its compounds can vary widely depending on the form. For potential hazard information, toxicity, and road, sea and air transportation limitations, such as DOT Hazard Class, DOT Number, EU Number, NFPA Health rating and RTECS Class, please see the specific material or compound referenced in the Products tab. The below information applies to elemental (metallic) praseodymium. Flammability (solid, gaseous): Product is not flammable. Naturally occurring praseodymium (Pr) has one stable isotope: 141Pr.